Have no idea of which the best video converter is? Want to play 5.1 channel AAC/DTS/WAV files without any limitation? Have the need to convert 5.1 channel AAC/DTS/WAV to and AC3 5.1/Stereo more? Wonder if there is a way to AVI, MKV, MP4 video files with 5.1 channel to AC3 5.1/Stereo video? The following article will introduce a universal 5.1 channel converter for Mac or Windows as well as a detailed tutorial on how to convert 5.1 channel AAC/DTS/WAV to AC3 5.1/Stereo. What’s AC3? AC3 is a file extension for surround sound audio files used on DVDs format. The AC3 file format was created by Dolby Labs for use in a Dolby Digital audio on DVD, Blu-ray and other digital video formats. AC3 stands for Audio Coding 3. AC-3 is the sound format for digital television ( DTV ), digital versatile discs ( DVD s), high definition television ( HDTV ), and digital cable and satellite transmissions. AC-3 is a 5.1 format, which means that it provides five full-bandwidth channels, front left, front right, center, surround left, and surround right. Here, Pavtube Video Converter Ultimate probably would be the best answer to the question mentioned above. It is simple to use and features fast conversion speed. The advanced encoding technology accelerates its conversion speed to great extent. With this universal 5.1 channel converter, you can convert videos (including DVDs, Blu-rays) much faster than other similar tools. 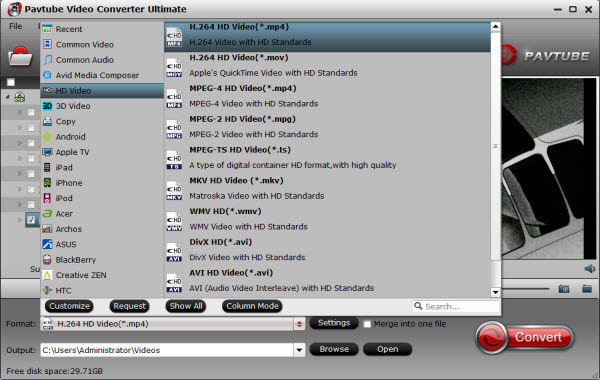 For Mac users, you can use Pavtube iMedia Converter for Mac. Step-by-step: how to encode 5.1 channel AAC/DTS/WAV to AC3 5.1/Stereo on Windows? Download this top 5.1 channel converter and launch it. Click the button of “Add Video” in the main interface to load your files. Besides, it supports batch conversion, you can import and transcode multiple movies files at one time. 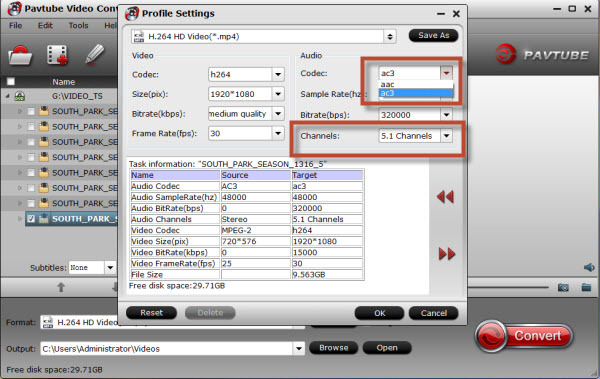 To convert video 5.1 channel AAC/DTS/WAV to AC3 5.1/Stereo sound, from “Common Video” choose desired video formats. Here, take converting AAC/DTS/WAV to MP4 AC3 for example, from “HD Video” choose “HD H.264 Video (*.mp4)” as the output format. Note: If you source video is in 6 channels and you want get 5.1 AC3 surround sound. Otherwise, click “Channels” drop-down and choose “5.1 channel”. Click “Convert” button to finish converting 5.1 channel AAC/DTS/WAV to AC3 5.1/Stereo audio. Once the conversion is complete, you can click “Open Folder” button to get the generated files with ease.